JDBC  (Java database connectivity)                Used to define providers and data sources. URL  providers                                    Used to define end-points for external services, for example, web services. JMS providers                                     Used to define messaging configurations for Java Message Service, Message Queuing (MQ) connection factories and queue destinations, and so on. Mail providers                                    Enable applications to send and receive mail, typically using the SMTP (Simple Mail Transfer Protocol). JAR file — A JAR file (or Java ARchive) is used for organizing many files into one and employ the .jar file extension. The actual internal physical layout is much like a ZIP file. A JAR is generally used to distribute Java classes and associated metadata. In JEE applications, the JAR file often contains utility code, shared libraries, and EJBs. 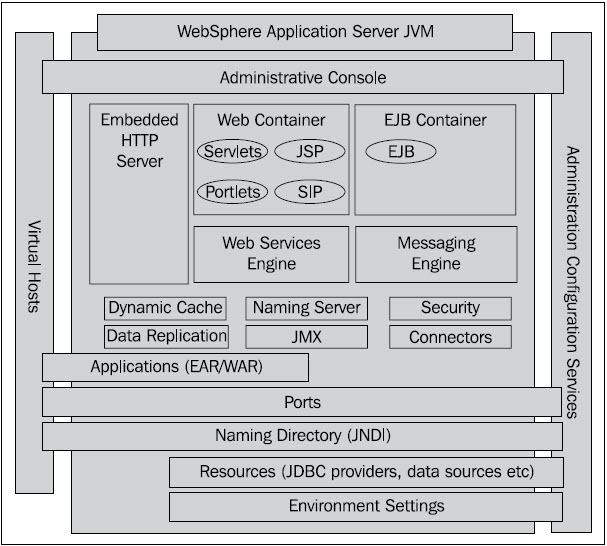 An EJB is a server-side model that encapsulates the business logic of an application and is one of the several Java APIs in the Java Platform, Enterprise Edition with its own specification. You can visit http://java.sun.com/products/ejb/ for information on EJBs. for a JDBC driver, it is a DBMS (Database Management System). Resource adapters and JDBC drivers are rarely created by application developers. In most cases, both types of software are built by vendors who sell products such as tools, servers, or integration software. WAR file — A WAR file (Web Application) is essentially a JAR file used to encapsulate a collection of JavaServer Pages (JSP), Servlets, Java classes, HTML, and other related files, which may include XML and other file types depending on the web technology used. For information on JSP and Servlets, you can visit http://java.sun.com/products/jsp/. Servlet can support dynamic web page content; they provide dynamic server-side processing and can connect to databases. JavaServer Pages (JSP) files can be used to separate HTML code from the business logic in web pages. Essentially, they too can generate dynamic pages; however, they employ Java beans (classes), which contain specific detailed server-side logic. A WAR file also has its own deployment descriptor called web.xml, which is used to configure the WAR file and can contain instructions for resource mapping and security.